I love to cook and bake and I make it a priority to serve my family healthy home cooked meals, but I am busy like everyone else. My schedule does not always allow me to spend a lot of time in the kitchen. So, how do I make my love of cooking fit into my busy life? I keep it simple. There are days when I spend all afternoon baking bread or making cookies, and I love to do that, but the reality is that most of the time I need quick and easy recipes. Not only do I need quick and easy recipes, I want them to contain everyday ingredients. This recipe for skillet tacos is a perfect example of both those things. It is quick and easy and contains ingredients that most of us have in our kitchen. What I love about this recipe is that it is just a basic idea. 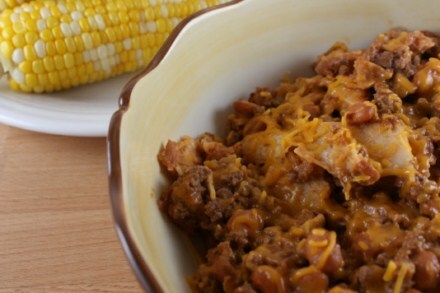 You can easily add some corn to this, or change it up by using a different kind of bean. If you like things a little spicy, serve this with hot sauce or salsa. You can really take this basic recipe and make it your own. What are your tips for keeping things simple in the kitchen? In a skillet cook ground beef and onion until beef is browned and onion is tender. Drain the fat off the meat and return to the pan. Add tortilla pieces, taco sauce, and beans. Combine and cook over medium low heat until heated through. Add cheese and stir until melted. Serve and enjoy! Lynn loves to cook and try new recipes. She lives in Oklahoma on 43 acres with her husband and three children. 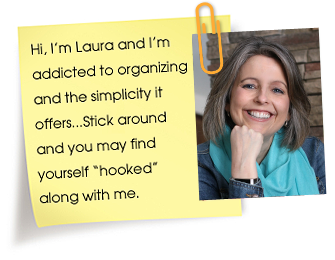 She blogs at Lynn’s Kitchen Adventures, sharing recipes, tips, and ideas to help you me blend a love of cooking with a busy life. She also blogs at Lynn’s Recipe Adventures where she writes about the challenges of food allergies. I did a blog search but did not have any luck finding the homemade taco sauce recipe you mentioned. Would love it if you could share it with me, either via email or in reply to this thread. I’ll bookmark it to check back. Yum!! This is going in the database to try. mmm. Thanks! YUM! I’m all about the quick cooking and this is definitely something that’s going on the meal list! Thanks! This sounds yummy… & easy… hmm…. Quick question…. the recipe calls for 10 corn tortillas. I’m thinking this means corn chips (like Tostidos). I wonder if taco shells would work, too. Yes, I use soft corn tortillas, but you could try chips. I think they would work and just have a little different texture. If you try it I would love to know how it works. Wait… I just re-read it. I think she meant soft tortillas. Mmmm! I think this would be a hit at my house. Thanks for sharing! I was going to make tacos, but made this instead. It was delicious. I used salsa instead of taco sauce. Even my picky kids proclaimed it yummy. Thanks. I am so glad that you liked it! My kids love it. This looks great and seems really easy! I do believe it will be added to my menu next week. Thanks for the share! Do you serve this alone or wrapped in a tortilla? I was confused. LOL It looks delish! Just made these tonight and they were awesome! Even my pickiest eater gobbled it up. Maria it’s served as is…the tortillas are cooked in pieces with it. Delicious!! Thank you! I made this last night, but added another can of beans and served it on warm flour tortillas like burritos. 🙂 Delish! This looks delicious! I think this may have to be our supper for tomorrow with corn from the garden on the side just like the picture you posted! 🙂 Yummy! Thanks for the recipe! Hope all is well with you! I would make this recipe without the tortilla pieces, then serve it with tortilla chips to scoop it up and eat! Looks SO good.